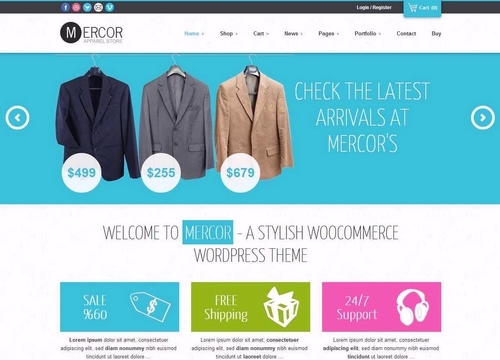 Mercor is a responsive e-commerce Wordpress Theme that uses Woo Commerce plugin to create Wordpress-powered shop with many layout options and unlimited color variations. This Theme comes with a plenty of options so you can modify layout, styling, colors and fonts easily. You can choose between a full width Shop and a shop with a sidebar that contains normal wordpress widgets and woocommerce widgets. Mercor theme comes with 4 custom home pages, choose between a great full width slideshow, nivo slideshow, shop page with slider or classical layout with portfolio and recent posts. Choose from 3 different blog pages- a standard blog, a minimalistic blog and a blog designed to look like portfolio. Showcase your featured content in home page using following built in Sliders- Full width Slideshow and Nivo Slideshow. Shop and Woocommerce pages, Portfolio pages, Contact page and Full Width pages. Simply add the content and choose the apporpriate template from a dropdown list. Customize your home page from 4 premade home pages available with this theme- with full width slideshow, nivo slideshow, shop page with slider or classical layout with portfolio and recent posts. Planning to buy Mercor theme from Theme Forest. Buy with Confidence. This page provides you with all possible Buying options. Usually Buying options or Pricing page of any theme designer is designed for conversions (to attract users and convince them to buy). Our Buying options page is not like that. We provide all the information about each Buying option. No hidden text or terms. We tried to cover everything that you should know before buying this theme.